In his speech from Salt Lake City, Utah, on Monday, President Trump called the national monuments he was there to shrink a “natural bounty” that the nation should put “to great and wonderful use.” In this administration, “natural bounty” and “great and wonderful use” do not necessarily refer to the monuments’ beauty and cultural value, but to the vast potential oil, gas, and coal reserves beneath them. If fossil fuels are the Holy Grail for the Trump administration—and his emphasis on “energy dominance” suggests they are—there is far more at stake than the 2 million acres the president rescinded from Bears Ears and Grand Staircase-Escalante’s monument designations. More than 120 million acres of protected land — larger than the state of California — are situated over rich reserves of oil, coal, and gas, according to a new analysis by Greenpeace’s Unearthed investigations team. They calculate that within those public lands are 28.9 million acres of national forests, 13.6 million acres of national wildlife refuge, 2.9 million acres of parks, and 7 million acres of wilderness overlapping with fossil fuel fields and basins. This is the first relatively comprehensive inventory of federally protected land intersecting with oil, coal, and gas deposits. Unearthed compared fossil fuel estimates from the US Geological Survey, Energy Information Administration, and Alaska Department of Resources with federal land data from the Geological Survey, using mapping software to calculate the percentages of federal land acreage that overlap. The government only estimates the amount of coal, oil, and gas that might be there; it doesn’t necessarily indicate that the sediment is readily accessible or financially profitable for industry to mine. But it offers an indication of the scope of lands that might be eyed by the Trump administration to put to other uses, such as leasing to industry for the extraction potential. Under that logic, not only the national monuments that Trump has already threatened, but many other lands considered as national icons and local treasures could be coveted for their potential deposits. The list includes Glacier National Park in Montana, the George Washington National Forest in Appalachia, and North Dakota’s Dakota Prairie Grasslands among them. The Senate voted Friday to open the Arctic National Wildlife Refuge for drilling; nearly half of the Yukon Flats — a 9 million acre wildlife refuge that lies just south of ANWR — overlaps with these fossil fuel estimates, as well. 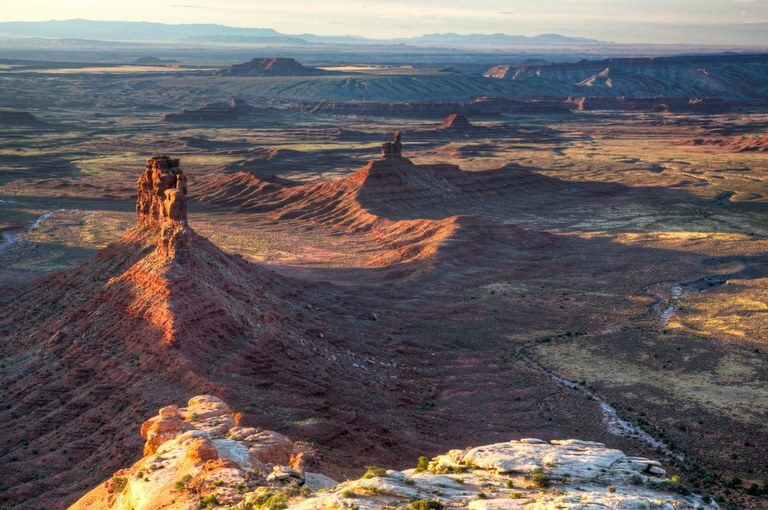 A view of Valley of the Gods from Cedar Mesa, a section of Bears Ears National Monument that lost protection under President Donald Trump's monuments review. For example, Trump’s Interior Department could change the rules for which national forests it deems “wilderness” — and off-limits to roads and other kinds of development — and what areas will be put to other uses, such as sale for leasing. Parks and monuments also face varying rules on whether they will be open for some kinds of activities beyond recreation, and whether the land around it is protected as well. In an executive order earlier this year, the Trump administration ordered agencies to review rules impeding oil and gas development; if what are known as National Park 9b rules are repealed, there could be an uptick in private drilling for oil, gas, and minerals, with the government leasing more mineral rights to individuals for what lies beneath the public lands.